(Newser) – When it comes to people killed by human hands, it's likely "the deadliest three months in human history," as USA Today puts it. That would be August through October 1942, according to a new peer-reviewed study. 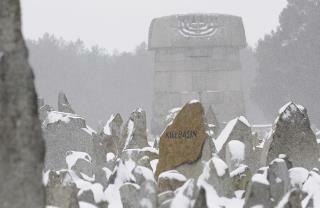 Researchers used detailed train transportation records to estimate 1.47 million Jews were murdered over the roughly 100-day period. That's about 25% of all victims of the six-year World War II. In the study published in Science Advances, the researchers write that Operation Reinhard, which ran from 1942 to 1943 with the intention of killing all the Jews in German-occupied Poland, "was the largest single murder campaign of the Holocaust," with 1.7 million victims, chiefly killed at the Belzec, Sobibor, and Treblinka death camps. But "the tempo, kill rates, and spatial dynamics of these events were poorly documented." The death rate in Stalin's gulags was about 20% in 1942, so you can add a few hundred thousand there. The numbers are grossly misleading......because there is NO CONTEXT given. In the USSR, alone, 20 million lost their lives (but in the whole war) Stories like this just give fodder to the wakkkko Holocaust deniers.